GREG’S FILM DIRECTORIAL DEBUT, a documentary called The Movement, was selected for Sundance and 20 other film festivals. His articles and columns have been published in The Huffington Post, the Frontier Airlines magazine, Warren Miller’s SnoWorld, Steamboat Magazine, Park City Magazine, and more. His story “The Dance of Making Baby” won the Oregon Arts Foundation’s scholarship in creative writing. And so on. In concert with his own projects and the creative endeavors of others, Greg frequently finds himself speaking in front of theater audiences, TV cameras, or radio microphones. Perhaps it was the puppet shows he put on as a kid, or maybe it was that speech about rats back in high school, and certainly it was there when he’d introduce Warren Miller movies to thousands of moviegoers each night: He’s never been afraid to stir up the enthusiasm of large crowds. It was at Sundance 2012 where Greg realized his lifelong fondness for words and stories had always followed a decidedly cinematic path. For him, on the big screen, stories can move. He’s a voracious viewer of movies and an eager strategist and collaborator for other filmmakers. Twenty years after his first day working at Warren Miller Films— the world’s longest-running film series— and now ten years deep into his freelance career, he continues to work on some of the most successful indie documentary film releases ever. Greg’s a bit of a world traveler, having circled the globe twice and zigzagged quite a lot. 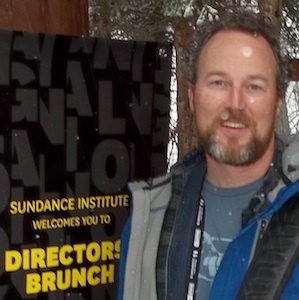 Prior to his ten years with Warren Miller Films, he spent three or four years earning an anthropology degree with an East Asian studies minor at The Colorado College. And before that, he danced lightly through the usual sort of high school nerdiness, which was shaped by many childhood years full of imagination and skinned knees. A native Oregonian, Greg now lives, works, and plays in Steamboat Springs, Colorado.